It is really not easy to be a doctor. Especially when it comes to making decision to save either the mother or the child. This episode was very touching and I was in awe of a mother determination to save her child at all costs. On the other hand, I was full of sympathy of Shi-On as he encountered his father again. Those memories of child abused was really terrifying. The fact the Shi-On father seem to be unrepentant makes me flare up with a character like him. I was worried about Shi-On reaction when he see his father and mother again. Is he able to handle all these betrayal, abandonment and violent abuse from his incorrigible father? The interaction between Shi-On and Yoon-Seo remains cute and interesting. Especially the part where Shi-On said he is going to buy a hammer at a convenience shop? Lol! He is actually looking for an excuse to walk her out. 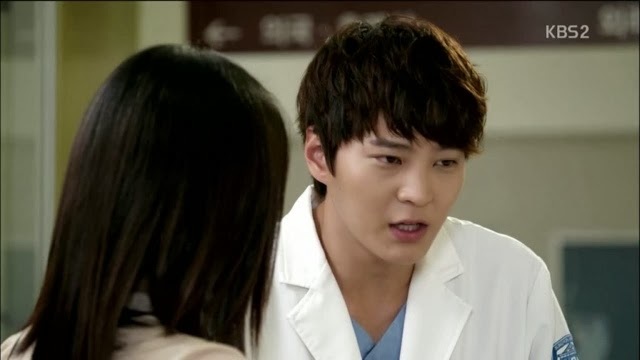 The way he pouts when he saw Do-Han waiting for her outside the hospital was so CUTE! Do-Han and Yoon-Seo looked compatible too. However, their chemistry is that of a siblings to me. Do-Han seldom show a cheerful side and gave me an impression of a stern person. After watching this episode, I discovered another side of him. However, the story about how Chae-kyung and Do-Han used to love each other deeply is still unconvincing in my eyes. Anyway, I support the other couple In-Young and Jin-Wook. The latter discovered In-Young secret trade and that is working in the nightclub. Oh dear! Chae-kyung and Shi-On friendship is sincere. Shi-On even revealed that he has a crushed on 'someone'! We know who is that person. Both of them is rather cute in their interaction.